In this years iCTF2014-2015, themed "hacking at scale", we reached the 3rd place out of more than 80 participating universities. Last Friday we participated in the ictf2014 and reached the 3rd place out of more than 80 participating universities. This years theme was "hacking at scale" with 42 services to pwn, most of which had been reused from previous iCTF's. 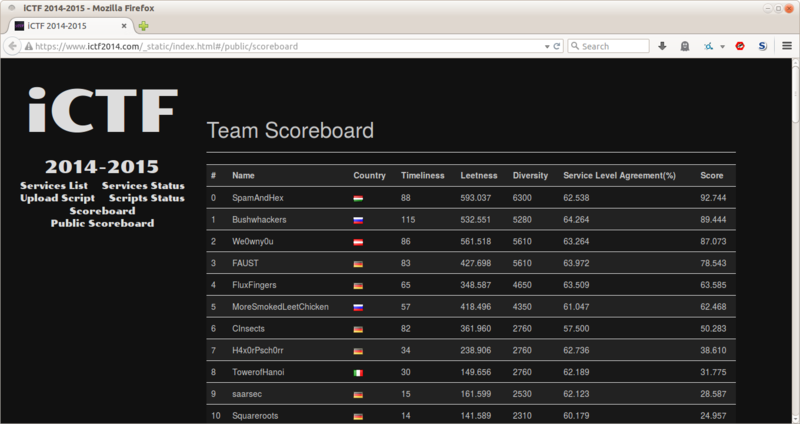 We constantly improved our score during the CTF until we were at the second place about one hour before the end with only Team Bushwhackers in front of us. However, SpamAndHex did an incredible finish, overtaking us, and finally also Bushwhackers about 5 Minutes before the end. Congrats to SpamAndHex and Bushwhackers for 1st and 2nd place. Big thanks go to SBA Research for providing Mate & Pizza during the Competition.